There's nothing quite like a beautifully restored American classic automobile that's got a little something awesome under the hood. It takes you back to simpler days when cars were metal, gas was cheap and the sound of a powerful engine roaring down the street made girls weak in the knees. This tribute to the great Amerian clalssic muscle cars features a beautifully rendered 1971 Dodge Challenger ready to eat pavement and the words in vintage type beneath saying, Detroit Muscle. 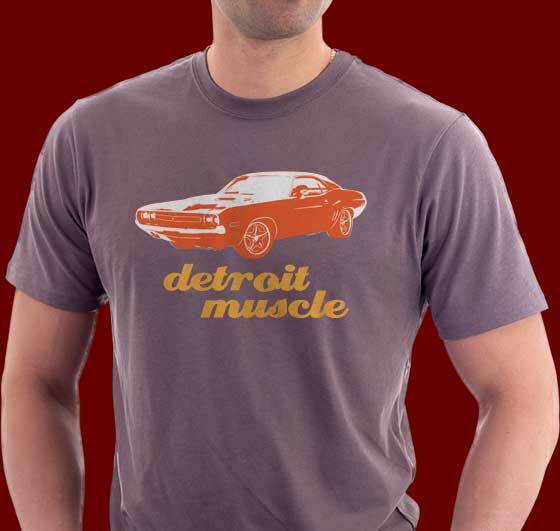 Classic muscle car fans will love the design and they are available in sizes to fit the whole family.